From running errands or maintaining your own beauty blog, there’s nothing a new mom can’t do… if she puts her mind to it! New mom fashion can be functional, comfortable, and stylish at the same time. Taking inspiration from the most happening celebrities, we bring you a list of six closet essentials that will become your new BFFs (Best Fashion Finds). This is not a misprint that was meant for a Maternity Must-Haves List. A favorite postpartum piece of clothing like this may already be in your wardrobe, but a seasonal upgrade is in the cards. The elastic, stretch nature of maternity jeans means they will flatter your curves on the day you give birth and for as long as you want to wear them after. We love the pedal-pusher style denims this season, with and without the rips. They go well with nursing tops and can be worn with a coat to sharpen up a casual outfit while keeping you warm. Dark denim is best if you are looking for something to match darker seasonal colors. Looking fine doesn’t always take time. Try one of these Fall Beauty Trends to see. If you plan to nurse your baby, then you’ll need a blouse that can easily accommodate that requirement. Button-downs can be both smart and casual, so there are a number of styles to love right now. As far as casual goes, a solid black, maroon, or dark blue on a cotton or knit blouse will give you a canvas outfit. Add fun accessories to amp up your look. Added bonus: these blouses wash easily after any excess milk drips or baby burping accidents. Dresses are ideal for getting ready at rapid speeds and let’s not forget, super convenient while carrying out your day-to-day activities. They’re also available in very flattering styles for a postpartum body, but you might want to pay attention to the length and choose something that you feel the most comfortable in. In comparison to most other clothing pieces, the necklines on dresses can be more baby-friendly. Be sure to pick styles with the least embellishments to maximize this style-factor of this piece. This season, mixing and matching styles and textures is a big trend. A symmetrical knit print could meet a solid dress skirt, so have a good look online at the dresses available to see If you can find a mix that flatters both your upper and lower body. 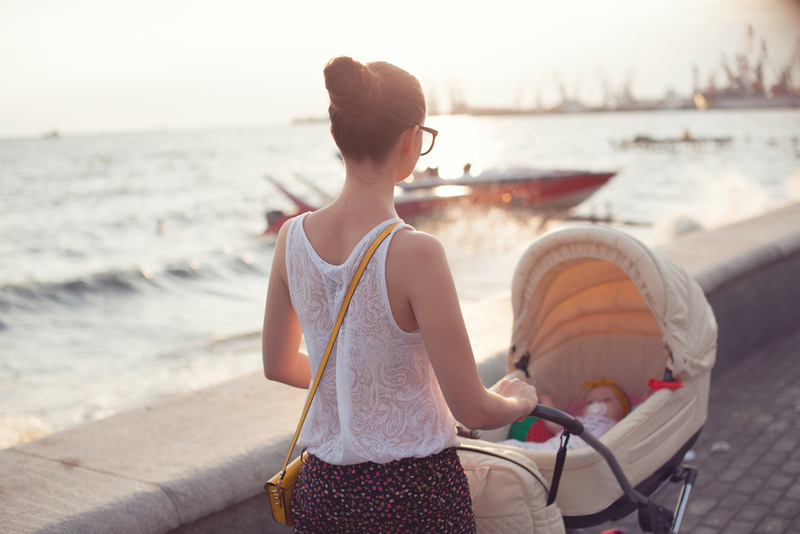 You don’t have to wear lycra to be Wonder Woman, being a mommy makes it so. And all this Wonder Woman needs is a top that accentuates her feminine curves but gives that recently-stretched-now-retracting tummy a break from the attention it’s received over the past months. The loose top is stylish in any fabric and works best if it’s more fitted across the bust and arms but drops, creating a babydoll waist. Red, navy, and blacks are in, and these colors can be used with stylish vertical symmetries to get the slimmer look. Have the energy you need to keep up with your little bundle of joy by adding these superfoods to your kitchen must-haves list. ‘Comfortable’ is the adjective of choice when describing what to wear while pregnant. In your postpartum months, when your muscles are pulling your body into a new shape, and a lot of weight is melting off, #comfort is still going to be trending in your wardrobe. Therefore, opt for the stretchy nature of elastic fabrics that make comfort very possible. Designers have made elastic waists look similar to fitted waistlines, so don’t confuse an elastic waist of 2017 with old-fashioned cuts that’d make you feel self-conscious when you shouldn’t. 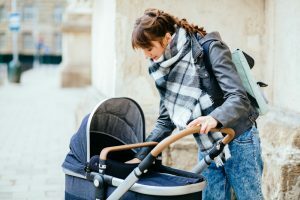 You’ll see a lot of flats with skirts this year, which will suit you as you zip around carrying a newborn. Midi length skirts with defined symmetrical shapes are in, as are contrasting prints with defined floral imagery. When the weather cools, remaining warm is essential for both baby and mommy. While sweaters can be easy to clean and carry, they are not easy to nurse a baby due to the tight neckline. Coats, on the other hand, are designed to be opened, and they are truly the definition of fashionable. Fashion this year is very feminine with an ornate flair. Rocking a red coat will give this baby momma some extra street style cred to help her look put together. Target has a wide variety of coats to select from, and you can earn Cash Back for all purchases made via dubli.com. Did the color red catch your attention this year, but don’t know if you’re confident enough to pull it off yet? Psst.. you are! Dare to be the most stylish mommy in town. Once you’ve mastered being a fashion-forward mom, it’ll be time to be the connected mom who knows everything about everything. Start by understanding how you can get the most for your money with Dubli.com’s Cash Back earning opportunities, while you stock up the best stuff for your little munchkins.